Why doesn’t CPS guarantee anyone with 90% up on the gifted test a spot in a program like NYC does? Katie: We simply don’t have the resources. If a family is white and live in Lincoln Park, should they even bother testing for a classical school? Katie: (I need to point out she is always so diplomatic!) Yes, you should definitely test! Kids from all Tiers have a chance to get into the programs and race is not a factor in selection. Me: (butting in again) 30% of the spots are given out on rank, so for a kid who scores well there are plenty of chances. Can kids apply to Academic Centers in 8th grade? How about getting into high school after freshman entry year? Katie: High school transfers can be taken. Applications are accepted in the spring. Different schools have different philosophies on whether they’ll take kids and what their criteria is. Contact the schools directly. What was done differently in the application process this year? Katie: Kids were informed of which schools they are eligible for and what data, if any, is missing so they can provide that to apply to certain schools. Was this done for kids in 7th and 8th grade? Katie: No, we don’t like to “poach” from existing schools (ie, steal kids from one program for another.) Also there are very few seats, so the schools promote themselves. How many tracts changed in Tier ranking this year? Katie: 97 went up 1 tier. 88 went down 1 tier. 2 went up 2 Tiers. Are Tiers here to stay? Katie: We’re keeping our eyes on what other cities are doing as well as a few court cases to make sure we’re in compliance. We don’t want to get challenged in court for any reason so we will continue to examine our policy. There is currently no impetus to change. We are currently maintaining socio economic diversity without using race. We’ll continue to monitor what goes on outside Chicago though. This is the document I saw that shows the Tier changes. Julia made a cool spreadsheet that shows the change in minimum cutoffs for the SE High Schools over the past 2 years. For Tier 3 and 4 Lane (previously a “back-up” school for many Tier 3-4ish kids) and Lindblom had very big increases in score minimums. Other schools ranged from +7 to +23 point rise over 2 years. Perhaps not as big as expected? So I guess we wait to see whether the SEHS cutoff scores go up any more this year…..
For may years, CPS used race (Caucasian, Non-Caucasian) to attempt to balance out magnet and selective enrollment program, with a goal of racial diversity. A couple years ago, the courts determined that race could no longer be used as a balancing factor. In its place, the Tier system was started with the goal of creating socio-economic diversity (and some would argue racial diversity still being a goal) within these schools. Each student is assigned a tier based on their census tract. This will affect the scores your child needs to place into a selective enrollment school (SE high schools, gifted and classical programs, academic centers) and also magnet programs. CPS says that the factors that go into the tiers are correlated with educational outcome. The scores needed for selective enrollment placement seem to bear this out as the higher tiers (4) tend to have higher scores than the lower tiers (1.) Of course there are exceptions within all tiers. One of the complaints about the tier system has been its imperfect nature. Some tracts contain a mix of families and one can surmise that the poorest families in the tract are at a disadvantage within their tier. 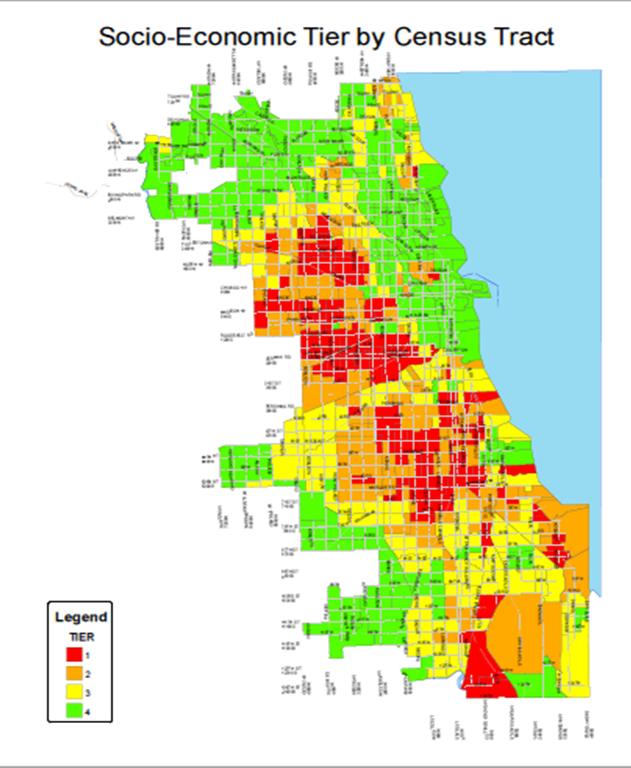 Every Chicago address falls within a specific census tract. We look at five socio-economic characteristics for each census tract: (1) median family income, (2) percentage of single-family homes, (3) percentage of homes where English is not the first language, (4) percentage of homes occupied by the homeowner, and (5) level of adult education attainment. We also look at a sixth characteristic, the achievement scores from attendance area schools in each census tract. Based on the results of each of these six areas, each census tract is given a specific score; these scores are ranked and divided into four groups – or ‘tiers’ — each consisting of approximately the same number of school-age children. This is how we establish the four tiers. Consequently, every Chicago address falls into one of the four tiers, based on the characteristics mentioned above. The process of updating the tiers for the 2012-2013 selection process is now complete. We apologize for the delay, which resulted from the redistricting of the census tracts as part of the 2010 census. MAP: You can determine your tier by clicking here to access the census tract map. The tiers are color coded. Use the legend on the lower right corner of the map to see which color corresponds to the tier. 1. Click here to go to the U.S. census website. 3. Scroll down to the table entitled “Geography Results.” Under the column “Geography Name,” look in the fourth row for your census tract number, followed by the county and state. 4. Click here to access the “Census Tract – Tier Information” document. The census tracts are sorted in numeric order; the number in the “short tract” column corresponds to the census tract number you obtained on the U.S. census website. Click “Control F” and type in your census tract number. The number in the third column is your tier. I’ve gotten some interesting analysis and POVs from 2 different blog readers that I’d like to share. The first is some information from Selective Prep (a test prep service) about the shift in scores needed for SE entry and what it might mean for kids entering high school in the next few years. The second is from a blog reader, Peter Bernstein, an economic consultant who teaches at DePaul and is the parent of a CPS student. I’ve attempted to imbed his nice tables but I know the 2nd once looks small. If you can squint, it’s pretty interesting. Thanks to both for some thought-provoking data! This year average admissions scores at nearly all Selective Enrollment High Schools declined. Lane Tech, Young, Payton, and Northside College Prep saw declines of 12, 10, 8, and 6 points respectively. This decline comes after years of successive and often significant point increases. This decrease in scores was precipitated by a change in CPS’ admissions policy. In November 2010, CPS changed the admissions formula from a 40%/60% Rank/Tier mix to a 30%/70% Rank/Tier mix. Students are admitted in the Rank category if they have the highest scores, regardless of their socio-economic Tier; while students in Tiers are admitted on the basis of their scores in comparison with other students in that Tier. This change effectively increased the percentage of students admitted in each Tier from 15% to 17.5%. While the scores of Tier 3 and Tier 4 students admitted to the most competitive schools increased or were flat, this was more than offset by an increased number of students from Tiers 1 and 2 with lower admissions scores. Students in Tier 3 and Tier 4 needed to get perfect or nearly perfect admissions scores to get into the most competitive schools. At Northside, for example, the average score of an admitted Tier 4 student was 892 and for a Tier 3 student it was 889 on the 900 point admissions scale. The average score of an admitted student in Tier 4 at Payton was 892 and for a Tier 3 student it was 884. Effectively, Tier 3 and 4 students seeking admissions to these schools needed to get in the top 5% on both their 7th and 8th grade tests – and of course all A’s in 7th grade. Additionally, the change in admissions policy made it possible for students with lesser academic records than in previous years to be admitted to Selective Enrollment High Schools. The lowest score of an admitted student declined across all schools, but this decline was particularly dramatic for the most competitive schools. Last year the lowest score of an admitted student at Lane Tech was 736, but this year it was 688 (-48 points). At Northside last year the lowest score was 850; this year it fell 58 points to 792. At Payton last year it was 855, and this year it was 806 (-49 points). At Whitney Young last year it was 818, while this year it was 784 (-34 points). With the release of the selective enrollment high school point totals for 2011, it is possible to compare each of the nine schools with their 2010 scores. I calculated the 2011 average score by taking the weighted average of the school’s average scores for Rank (30 percent of students), and each of the four tiers (70 percent of students in total). My calculation for 2011 is compared to the average scores from 2010, found at the CPS and various other web sites. One difference this year is that only 30 percent of students were admitted based solely on having the highest scores (“Rank’) with 70 percent coming from the students having the highest scores in each of the four census tiers. That differs from the 2010 policy in which 40 percent of students were admitted by Rank and 60 percent by Tier. As a result of having fewer Rank admissions, overall average scores were a bit lower this year than last, with seven of the nine schools showing a decline. Lindblom (+11) and Jones (+6) were the only two schools to show an increase in their average point total from last year. By my calculations, Jones actually moved slightly ahead of Young, 859 to 858. Last year, Jones was 15 points behind Young. 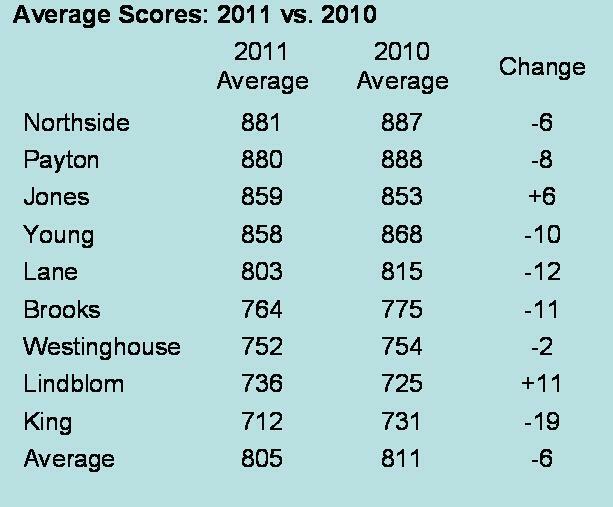 Northside and Payton continued to be the two highest-scoring schools. The average of the test scores of the nine schools in 2011 was 805, six points lower than in 2010. Another area of interest is the minimum scores for admission for each school, also known as the cut-off scores. As most of you know, 40 percent of the admissions are based entirely on the student’s score (referred to as “Rank”) and the other 60 percent are drawn equally from the highest performing students in each of the four census tiers designated by the CPS. 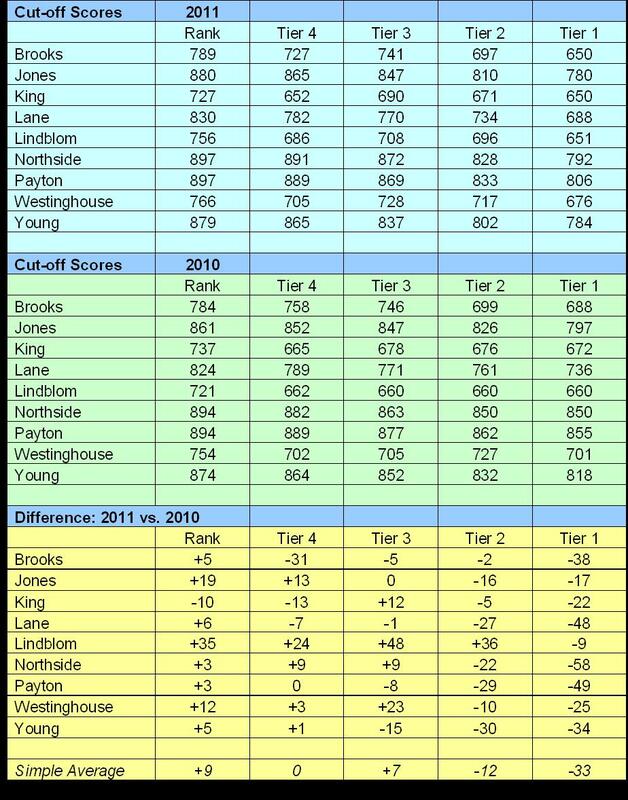 In general, the cut-off scores were higher in 2011 than in 2010 for the Rank category with Lindblom and Jones showing the biggest increases. Cut-off scores for students from Tiers 4 and 3 were sometimes higher and sometimes lower, depending on the school. Cut-off scores were lower for students coming from Tiers 1 and 2, especially for students coming from Tier 1, where they were anywhere between 9 and 58 points lower in 2011 than in 2010. As an aside, the cut-off is the minimum score for a student from a given Tier, not the average score. For example, the minimum score for a Tier 1 student admitted to Payton was 806, but the average score for all the Tier 1 students admitted to Payton was 849. I don’t have data for average scores by tier in 2010, but it seems to me that the lower cut-off scores for Tier 1 and Tier 2 suggest that the selective schools had fewer applicants from these areas in 2011 than they did in 2010. If so, the CPS might think about how they can get more high-performing students from the Tier 1 areas to apply to the selective enrollment schools. The CPS might also consider reworking how they categorize different census blocks into the four tiers. 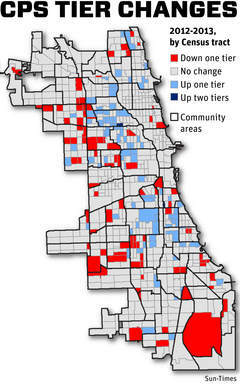 With the release of the 2010 census data, it is likely that several areas will see their tier change next year.